Bora Bora, like other islands in Tahiti is extremely relaxed. The locals extend a warm welcome to visitors and enjoy showing off their traditions and slow paced way of life. The people here have a passion for all things music and dance, and can often be seen performing traditions song and dance for tourists. The philosophy here is ‘hakuna matata’ which means ‘don’t worry’. You will feel the tranquil vibes and relaxed atmosphere as soon as you step off the plane. There are plenty of wonderful places to eat where you can try some diverse dishes. 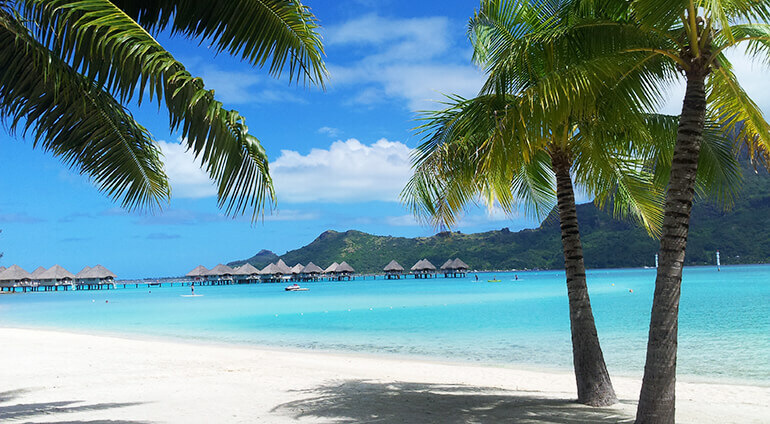 Tahiti’s islands are famous for their delicious food and Bora Bora is no exception. Here you can try all sorts of cuisines including Italian, Vietnamese, Polynesian, Italian, French and Chinese. Naturally there’s a lot of fresh seafood on offer including freshly caught ocean fish. Make sure you try the national dish poisson cru which is raw fish marinated in lime juice and coconut milk.